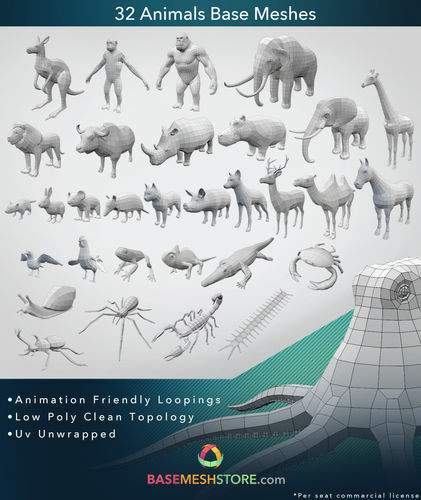 Get produtivity with 32 Animals low poly ready-to-use. Each model was made thinking on best attend o artist beggining a model. Good proportions, a low poly easy to edit, deformation friendly topology and UVs unwrapped! Just 2$ each! Animals included in package: Armadillo, Beetle, Bufallo, Camel, Centopede, Charmeleon, Chimpanzae, Conch, Crab, Crododile, Elephant, Conch, Deer, Crocodille, Deer, Fox, Frog, Giraffe, Gorilla, Horse, Kangaroo, Lion, Mammoth, Octopus, Orc, Pic, Pigeon, Rabit, Rhino, Roster, Scorpion, Spider.